The Cards app for iPhone is a brand new way to send greetings cards on the go. Forgotten someone's birthday, but can't get out of the office to buy a card? This app may just be the answer you are looking for. Instead of spending hours trawling through shops to find the right card, the iPhone card maker does all the hard work for you, including postage! Let's take a look at some of the best and worst features. To make the app super easy to use, the cards are listed in 6 different sections. The sections are Thank You, Holiday, Baby, Birthday, Love, and Travel. Although those sections don't cover every type of greetings card you could buy in a shop, they do cover the ones which are most commonly bought. There are varying numbers of card designs in each category, and many of them can be changed so you can add your own photos and change the words to suit your needs. The downside is, aside from different wording, many of the designs are exactly the same in each category. Each section has at least one unique design, but the rest are variations on the same thing which slightly ruins the brilliance of the app's concept. card you want to send, you are faced with a scrolling list of design choices. They range from very simple cards with words in the center and a border around the edge, to cards you can add your own photos to. The ones you can add pictures to are the most interesting, as there are several different border designs available. When you have found a design you like, tap on it, and you will be taken to an editing screen. There are three options along the top which represent the outside of the card, the inside of the card and the envelope. Each one gives you the chance to edit the things you want to change. 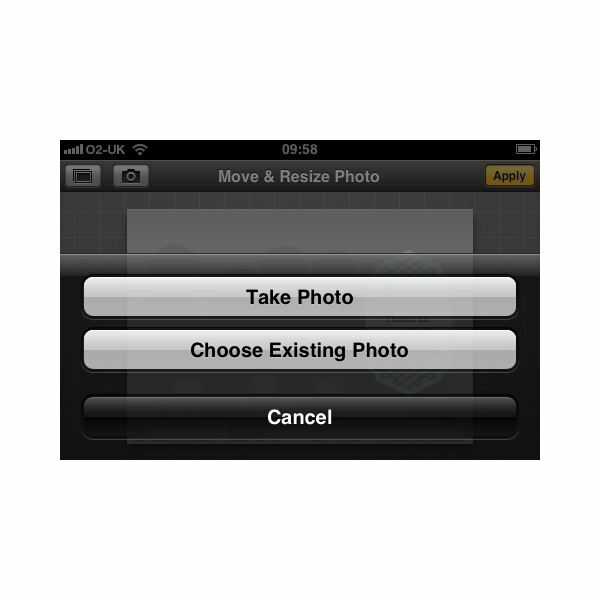 To add photos to the front of the card, double tap the screen and you will be given the option to take a new photograph, or choose one that is already in your library. Double tap again on the picture you want, then resize and move it onto the card until it looks exactly how you want it. When you're finished, click on Apply. You can also edit the words on the front of the card by tapping on them. 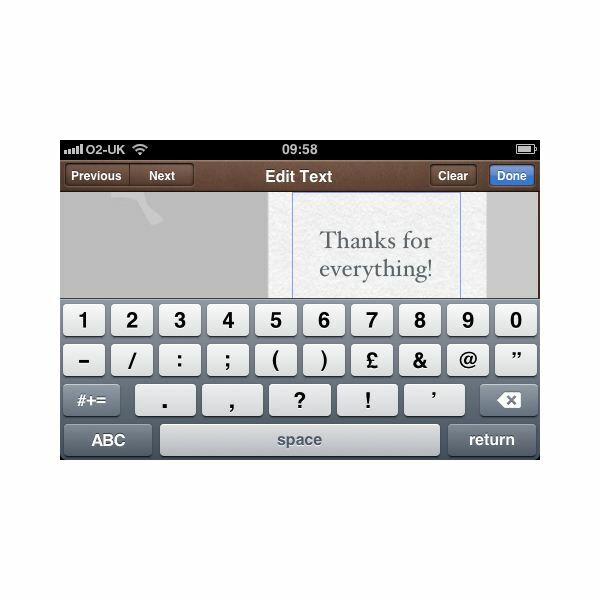 You will then get a text box and you can type in your own special message. Following this, you can edit the inside of the card with words of your choice, and then the envelope. If you are one of those brilliant, organized people who stores addresses on your phone, you can add addresses directly from your contacts list. Otherwise, you will need to type it all in. One problem I faced when typing in my own address was that it told me it was not verified. I found this particularly odd as my house has been standing for more than 30 years! According to others who have tried it, they had the same problem, so it's nothing to worry about. The best thing about this app is the convenience factor. You can send a card from anywhere, to anywhere with minimal effort. It is a great way to send a postcard from vacation, complete with your own snapshot! It is also very easy to use. You don't need to have any design skills, or special iPhone knowledge to make it work. Every step is self-explanatory, and you can't really do anything wrong. Another bonus is that it has a "Save" feature. If you are in the middle of a design, and you suddenly need to stop, you won't lose your work. It gets stored, and you can pick it up again when you're ready. Finally, it's free to download, so you can test it out, and if you don't like it, you don't lose anything. Unfortunately, the downsides outweigh the upsides. The most disappointing thing about the Cards app is that there is not enough freedom in the design choices. You can't even change the colors of the borders, so if they don't match the photo you choose, there is nothing you can do about it. The variety of designs is also a letdown. There is very little difference between the cards in each section. There could have been more emphasis on birthday designs, or new baby designs but as things are, you might find it hard to distinguish between them. The price for sending cards is quite high. To send just one card, it's fine. But if you wanted to send a special holiday card to all of your friends and family, it would cost you a small fortune. The speed of card arrival is unknown. When I posted the card I ordered, I didn't get any information on how long it would take to arrive. By this standard, I would not use it as a last minute option, because it could take several days to reach its destination. Overall, my answer would be to avoid it. It is fine if you want to play around and send an occasional card, but the Cards app seems to be a lot of hype over nothing. The cost of sending cards wouldn't be half as bad if there was more freedom to change the designs, but for what you get, it is a huge disappointment. Compare the app to an online store like Moonpig, and you will see just how poor Cards is. At Moonpig, you can do everything this app can do, but with much more choice, guaranteed next day delivery, and at a cheaper price. It's worth a look if you are intrigued, but I am sad to say, it is hardly worth the time.